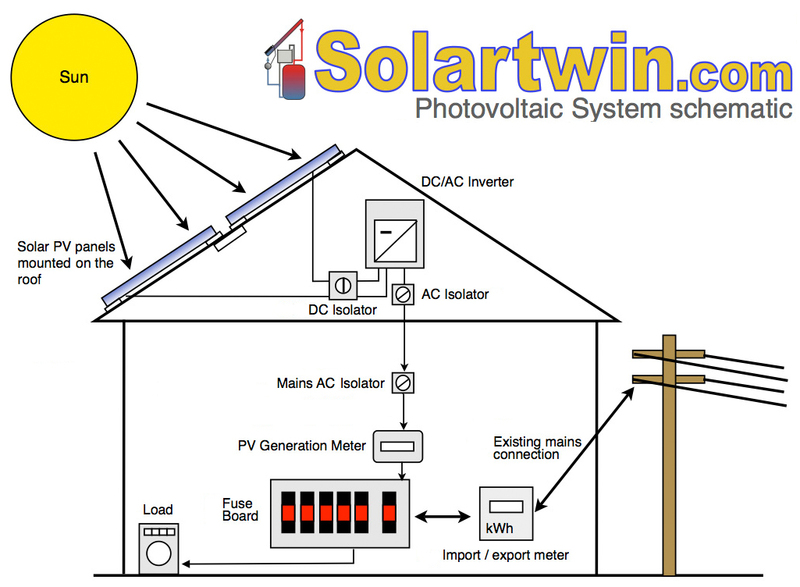 Home » Solartwin Features » Solar BASICS – What is Solar? » Solar PV (Electric) Power Systems – All the useful basic info. Solar panels how they work. Solar PV installers. Solar electricity. Solar photovoltaic PV suppliers. PV Solar modules. Home electricity generation UK. PV Feed in Tariff. FIT. Solar Clean Energy Cashback. The advantages of solar power. How do solar panels work for electricity generation? Photovoltaic panels: facts about photovoltaic systems.S.O.L.A.R. Photovoltaic (PV) Solar Electric Panel Installations – Basics/FAQ. Choosing solar PV system suppliers and installers. There is an interesting variety of domestic solar PV systems on the UK solar market, with often subtle variations in PV system components. UK solar suppliers for 11 years, with our expertise and experience, Solartwin will always specify a high quality PV solar electricity system tailored to meet your specific requirements using carefully selected MCS accredited PV products such as Sharp solar PV panels. Call us now for a solar quote on 0344 567 9032. It is essential that your solar PV installer is accredited under the Microgeneration Certification Scheme (UK MCS) because it is a precondition for you receiving the Government Feed-in Tariff (FIT) payments for PV generated renewable electricity. Always choose an MCS PV installer as your photovoltaic supplier and installer, because they know how to install photovoltaic panels to the highest standards in the solar electricity industry. Solar Twin Ltd are UK Microgeneration Certification Scheme approved PV installer with a nationwide network of local PV installers. We offer a full turn-key PV installation service on all of our PV systems. We are members of PV UK. We adhere to the Renewable Energy Association Consumer REAL Code giving you the peace of mind that your solar PV installation will be properly quoted, professionally executed and fully guaranteed by expert solar PV suppliers and installers. This section is about how solar PV works. Solar photovoltaic (PV) systems take energy from the sun and convert it to zero carbon solar electricity. Installing a solar PV system gives your home building its own roof top power station so you can make electricity from the sun. The advantages of solar energy include reducing your energy consumption and carbon emissions and saving money. Under UK’s Feed-in Tariff for Low Carbon Electricity, eligible solar PV installations from Solar Twin Ltd can earn an elevated tariff (based on 100% FIT plus 50% PV power export tariff) averaging 42.5 pence per unit for every unit of solar electricity generated for a period of 25 years. This makes the return on investment for solar PV far better than most bank interest rates. 1 – Solar DC/AC Inverter – this small box converts the solar direct current (DC) electricity generated by your solar PV panels into alternating current (AC) electricity. Technically, the inverter ensures that its PV generated output voltage is slightly higher than that the electricity which is coming in from the grid. This means your home appliances will use electricity from your PV system before they start drawing from the grid, reducing your home’s energy consumption. If your solar photovoltaic installation is generating more than is required by your appliances at any moment, the surplus PV electricity you generate will simply be exported onto the grid for others to use. You will be automatically credited with the appropriate photovoltaic electric units by your electricity meter for the times when you are a solar PV energy exporter. 2 – Solar PV Panels – also known as PV modules are the main building blocks of a solar PV system. PV panels contain a series of smaller photovoltaic cells which are connected together. The PV cells made from a material (usually silicon) which converts light into electricity. A number of PV panels are connected together to form a PV array. A PV array of several PV modules is what will be installed on your solar roof. Solar PV technical jargon. The electrical power output at any moment in time measured in Watts (W). Solar PV installations are usually quoted for in peak performace terms, called kilowatts-peak. (kWp). Domestic solar PV installations tend to be in the size range of 1-4 kWp. The annual amount of solar energy generated is measured in “electrical units” which are also called kilowatt-hours (kWh). The current Feed in Tariff (FIT) subsidy is 21 UK pence per kWh of solar electric energy – for 25 years. Solar PV modules perform best when mounted at a angle of around 30 degrees. However, there is some flexibility here; for instance, you can mount PV modules at an angle as low as 10 degrees. At this angle the PV system performance over a year is only reduced by around 5% and the PV module angle is still steep enough to stop dirt building up. While the 100% perfect PV panel orientation is due south at 30 degrees, this is not critical. In fact, most orientations on the southern half of the compass can be used, right round to due east or due west. So nearly all homes will actually have a suitable roof for a PV installation. On a 30 degree East or West facing roof in UK or Ireland the annual performance of a PV system will typically be reduced by only 15%. Technically, Solar PV panels (or PV modules) are usually over 1 sqm in area and consist of a series of individual low voltage photovoltaic cells wired together (in series) under a sheet of highly transparent, hard glass. The PV cells are usually made from one of three different types of semi-conductor material. The commonest are polycrystalline or monocrystalline silicon photovoltaics. These are usually the most cost effective PV panel materials. Polycrystalline PV panels tend to look slightly more textured and glittery than monocrystalline PV panels because the latter have fewer crystal edges to reflect light. However this is barely noticeable except, when you look at the PV cells close up. Which type of PV should I choose – polycrystalline vs monocrystalline vs hybrid PV. Poly-crystalline PV cells start with a multicrystalline ingot of silicon, not one single, and more, costly silicon crystal which is carefully sliced up into thin slices using a wire saw. Monocrystalline solar cells, and the solar modules which are build up from them, are manufactured using single silicon crystal ignots, which are again sliced up. In general, monocrystalline cells, although more expensive, are marginally more efficient, but marginally more expensive than poly-crystalline photovotlaic solar panels. While delivering best value for money PV is our main approach, monocrystalline photovoltaic solar cells may be preferable when roof space (rather than budget) is a limiting factor. To push the boat out, we can also quote instantly for even higher efficiency “hybrid” PV panels which combine monocrystalline silicon cells with an extra photovoltaic film. This generates a little extra PV power by making use of more wavelengths (colours) of sunlight. Please ask us for more than one PV installation quote on 0344 567 9032. It is important that no part of the PV array is shaded. Shading reduces the performance of the whole PV installation, not just that of the shaded PV module. How do consumers benefit from installing a PV system? Firstly, by avoiding the cost of purchasing the PV generated electricity from the grid. Electricity prices are expected to rise sharply over the next few years, so the savings from installing a solar PV generation power station on your own roof are likely to increase. Secondly, FIT income. Under the UK’s Feed-in Tariff (also known as Clean Energy Cashback) for 25 years you are entitled to a payment of 21 pence for each unit of PV electricity that you generate with your photovoltaic installation, whether you use it or not. The amount you earn from your PV installation depends on how much solar electricity you actually generate. You need to sign up as an MCS installed PV home to register for the Feed-in Tariff. We will do this MCS registration process for your PV installation. Finally PV’s reduce your household carbon emissions. The UK Government calculates you save 568 grams of CO2 for each unit of photovoltaic electricity that you generate (whether you use it or export it). Sharp PV’s, Caymax PV’s, Sanyo PV’s, Kyocera PV’s, TG Solar are among the many types of PV modules which we fit. The PV inverters we fit include SMA inverters, Fronius inverters, and Eversolar inverters. The advantages of solar power have never been so good! Time to go green with Solartwin solar PV solar power systems!